We would welcome a few new members when we restart on April 12th 2013. If you are interested please ring Alex Sharratt on 01803 866682. Our group is reading books relevant to our Inner Transition in the TTT movement, believing that if we really want the world to change, we have to change ourselves and our ways of seeing as part of this. We have concentrated on the ‘soul’ aspect of ‘Heart and Soul’, which is sometimes avoided. We began with Karen Armstrong’s ‘Compassion’ in the late summer of 2012, and then moved to Andrew Harvey’s ‘The Hope’ following his lecture in Totnes, at the beginning of October. This we followed by Bede Griffiths’ The Marriage of East and West in January 2013. There are seven of us in the group; we meet weekly for 2 hours, and we read a chapter or so of the books at home, having got our own copy, and then discuss in the highly enjoyable and educational sessions. The emphasis for the first two books was on the application of a new vision for the world, and how this is relevant for TTT and more particularly for ourselves personally. From the beginning we all brought in personal material on our lives and our beliefs in relation to what we have read, and this has led to deep sharing between us and to the creation of a group which has been a highlight of the week for us. We are about to start our fourth book; Brian Swimme’s ‘The Universe is a Green Dragon’ ; which incorporates modern science into this wider view of knowledge “that renders obsolete all the old explanations of reality and allows us today to reinvent the human being in a new cosmic story”. Brian has been a regular visitor teaching at Schumacher College. We will continue to incorporate discussion on the inner transition and its relationship to the transition movement we all seek together. ‘ The Marriage of East and West’ by Bede Griffiths. The scope of the book was ambitious, to say the least. As the title suggests, it was to put Eastern and Western religious thought into a common framework and reconcile the two. The book was divided into three sections, the Vedas, Judaism and Christianity. Griffiths explains that as a "sanyassi" [a monk] he has to look beyond symbols to their ultimate truth, and sees this "perennial philosophy" in all religions. The difference between East and West is more one of emphasis. The Vedas were considered by Griffiths to contain qualities that were missing from Judeo-Christian thought. We were introduced to the concept of the divine being" Saccidananda", the combination of Being, Consciousness and Bliss. These in turn could be interpreted as Brahman, Purusha and Atman, the divine in nature, beyond nature, and in the soul. The stress in the Vedas is on levels of consciousness. Judaic thought was considered by Griffiths, a Dominican monk, to be lacking in the metaphysical dimension found in the Upanishads, emphasising instead the linear aspect of time and the purpose of creation. There was not much emphasis on levels of consciousness, but rather on ideas of "righteousness" and justice. The myths of the Old Testament were mentioned as 6 fold, the Story of Creation, Paradise Lost, the Promised Land, the Exodus, and the Messiah and the New Jerusalem. These were traditionally considered to be grounded in history, but could, according to Griffiths equally well be seen as states of consciousness. Christianity took up the themes of the Old Testament, and also chose to interpret the scriptures as taking place in linear time. This , Griffiths blames on Greek and Latin thought and Western rational thought in general ,which reached its apoge at the Renaissance, but went downhill after that, losing the power of mythical thought, or, as Griffiths described it, intuitive thought. Intuitive thought has to be received with your whole being; senses, feelings,and imagination, as well as the rational input. Writers like Tolstoy, Dostoevsky and Dante are mentioned as examples of this intuition or insight. Dante says "Henceforth my vision mounted to a height where speech is vanquished and must lag behind." Griffiths says that this is the aim of all religion, to give the experience of the pure joy of the spirit, where you realize you are one with the divine. The Hindus achieved this in meditation, the Christians by dwelling on the physical historic event of Golgotha and the Resurrection. But it was harder to achieve the same level of awareness in Western tradition, because there was not an equivalent concept of Atman, the idea that you had to be passive and receptive to achieve enlightenment [although the not-well-understood concept of "grace" could be the Christian equivalent]. Griffiths doesn't like Jung's idea of the "unconscious". He prefers to call it "subliminal", just below the level of consciousness, but accessible to those who can think with their whole person, including the senses, the feeling, the imagination, as well as rational thought. But on the other hand, how are we to understand the Hindu idea of "maya"? If the world is illusion, nothing matters. But modern science is coming round to the idea that matter doesn't really exist on its own and needs consciousness to be present. The Crucifixion in Christianity and the Resurrection could also be given this interpretation. "The physical body and with it the whole of the organic universe - the field of energies - to which it belongs are destined to be totally transformed by consciousness." What of the Hindu lack of vision concerning Justice and Peace? If this world is of such great importance to the Jews and Christians, then religion becomes simply an NGO, and the spiritual dimension can be lost. This is where the marriage of East and West can take place. The East needs to concentrate on being a bit more in this world, and the West a bit more in the other. This seems like a contradiction to what Griffiths says earlier, when he says that the Jews did not see God as imminent in nature, but as transcendent, and the Hindus saw the divine in nature, but were not so obsessed with ideas like justice and peace and compassion. But perhaps this has to do with whether you are looking at the world from the perspective of Man or Nature. In the West we exploit nature, in the East they revere it. But perhaps in the West we have a stronger idea of the spiritual destiny of society, and Man's place in that world. Griffiths finally explains the relationship between all the various terms used in East and West. "Saccidananda" or Being, Consciousness and Bliss, can be interpreted in the Hindu tradition as Brahman, Purusha and Atman; in the West as the Father, Son and Holy Spirit...hence the Holy Spirit and Atman are the feminine receptive spirit, the Son and Purusha being the consciousness of the transcendent divine, and Brahman and the Father being the ground of the created world. The book ends by quoting St. Paul," Now we see through a glass darkly, then face to face. "All language is imperfect to describe the spiritual worlds. Well, that's the book in a nutshell, which obviously doesn't do justice to Griffiths mastery of the subject. If there is anything to criticize, it is probably his over-enthusiasm for the Upanishads and his dismissal of the richness of Judaic and Christian thought; the Psalms, te evolutionary levels of consciousness in the Tree of Life of the Kabbala, and the writings of Dionysius the Areopagite, who described a whole series of hierarchies who created the physical world. 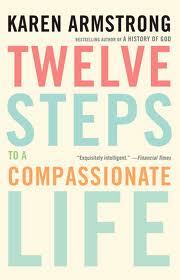 The Inner Transition Reading Group convened after Easter 2012 and we started reading Karen Armstrong’s book “12 Steps to a Compassionate Life”. We met every Friday until mid July and though not all of us managed to attend every meeting, most of us finished the book and thoroughly enjoyed the experience – especially the discussions it generated. Karen Armstrong, whom many will know from her visits to Dartington’s Ways with Words Festival, has established a worldwide campaign for Compassion through this book and the Charter for Compassion (www.charterforcompassion.org). The book starts by examining the definition of compassion itself. The Oxford English Dictionary defines it as “ pity leading to action”, but Karen Armstrong doesn’t like this. She feels a more accurate definition should be “suffering with”, which she equates to the Golden Rule of Confucius “do not do to others what you wouldn’t want them to do to you”—or it’s more positive equivalent “do as you would be done by”. Her book encourages to to start with compassion for ourselves, then for those around us, and finally for the whole world. The book was written with group activity in mind, and is addressed to people of all spiritual persuasions and none. We read a chapter a week at home, and then came together every Friday to discuss and compare our impressions. The sessions were always lively and wide-ranging. Sometimes things shared were very personal; sometimes we grappled with wider philosophical issues. We didn’t always agree with her. Some thought the “do as you would be done by” analysis could be seen simply as enlightened self-interest and nothing to do with spiritual activity at all and to be ignoring her own definition of “suffering with”. Others thought that the words “empathy”, “sympathy” and “compassion” seemed to be used interchangeably. We defined empathy as a thinking activity, an imaginative activity, while sympathy is more a heart activity, and compassion a physical reaction, a gut reaction, a recognition of the pain in another connected with our will to do something about it. She is extremely knowledgeable about the development of the all the world’s faiths and was very respectful of each tradition. We all learnt a lot in this regard. She spoke a great deal about the Buddhist Four Immeasurable Minds of love, of which, karuna or compassion is just one aspect, and her commitment to Socratic dialogue and helpful questioning, as opposed to grand-standing in debate was a useful tip for group work. As the Dalai Lama has said, “ Fear, hatred and suspicion narrow your mind…. compassion opens it.” This book certainly opened our hearts and our minds and, if we didn’t always agree what compassion actually was by the end of the book, at least we were aware of our differences, of our own limitations, how much further we had to travel and that we had made some new friends on the journey.